In stock -This product will ship today if ordered within the next 10 hours and 5 minutes. 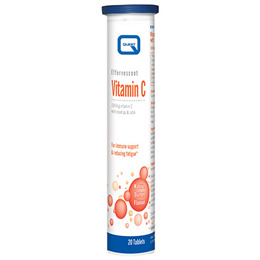 Provides 1000mg of vitamin C per tablet plus rutin and rosehips. Dissolves quickly for fast nutrient absorption. Natural orange flavour. Vitamin C is an antioxidant nutrient that contributes to the protection of cells from oxidative stress and to the normal functioning of the immune system. Vitamin C helps towards collagen formation for many body tissues including skin, gums, teeth and cartilage. It is also involved in energy metabolism and contributes to the reduction of tiredness and fatigue. Acidity regulator: citric acid; L-ascorbic acid; acidity regulator: sodium carbonates; firming agent: sorbitols; natural orange flavouring; rose hip extract (from rosa canina); beetroot concentrate powder; sweetener: sucralose; firming agent: polyethylene glycol; maltodextrin; rutin; bulking agent: acacia gum; colour: riboflavin. Take one tablet daily dissolved in a glass of water. Do not exceed stated dose unless instructed by a qualified health professional. Contains sorbitol - excessive consumption may cause laxative effects. 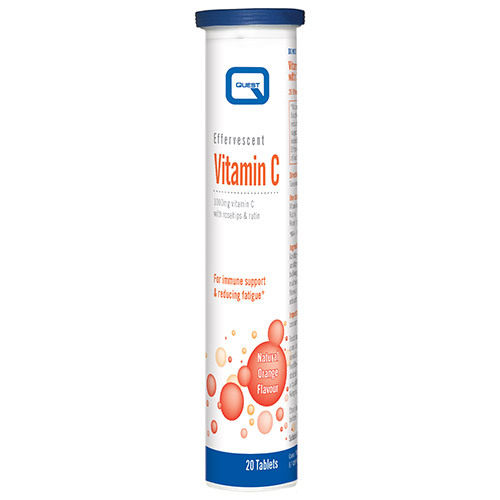 Below are reviews of Effervescent Vitamin C - Orange Flavour - 20 Tablets by bodykind customers. If you have tried this product we'd love to hear what you think so please leave a review.